The California and Carolina Leagues have revealed the rosters for their joint 2010 All-Star Game, which will feature some recent Draft picks and top prospects. The Myrtle Beach Pelicans will host the contest on June 22 along with sending two pitchers to the game, Braves prospects Julio Teheran and Randall Delgado. The Pelicans' coaching staff, led by manager Rocket Wheeler, will man the Carolina League dugout. 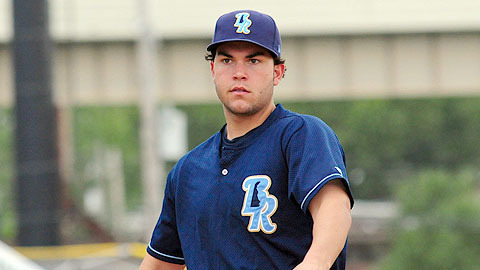 Carolina's roster also features the circuit's top hitter, Kansas City's 2008 first-round pick, Eric Hosmer, who is batting .359 for Wilmington. Winston-Salem's Seth Loman (White Sox), who leads the league with 14 home runs, will join Salem's Ryan Lavaranway (Red Sox), who tops the league with 48 RBIs. Kinston's T.J. McFarland (Indians), who paces the Carolina League in wins (6) and ERA (2.08), will lead a stocked pitching staff that also includes Wilmington's Alex Caldera (5-2, 2.92) and Winston-Salem's Nevin Griffith (4-1, 2.77) and Greg Infante, who is tied for the league lead with eight saves. The West Coast crew counters with an equally loaded roster. The California League's active batting leader, 2009 fifth-round pick Brandon Belt, takes his .378 average to Myrtle Beach, along with San Jose teammates Juan Perez, an outfielder batting .339, and pitchers Craig Westcott and Eric Surkamp. Giants manager Brian Harper and his field staff will lead the team. High Desert first baseman Rich Poythress, Seattle's second-round pick last June, leads the Cal League with a dozen homers and rounds out an infield that also includes Rancho Cucamonga's Alexi Amarista (.339, 31 RBIs) and Lake Elsinore's Cole Figueroa (.347, 39 RBIs) and Drew Cumberland (.369, 7 HR, 31 RBIs). The California League, known for being a rough destination for pitchers, features some elite arms. The Quakes' Tyler Chatwood, the Angels' second-round pick in 2008, owns some of the team's best pitching numbers, including a league-best seven wins and a sparkling 1.87 ERA. High Desert's Kenn Kasparek ranks second in wins (6) and owns the league's fourth-best ERA (2.34), while Westcott (3-0, 1.38) has allowed just eight earned runs in 52 innings this season. The league's top closer, Lake Elsinore's Brad Brach (3-1, 1.91 ERA) has a circuit-leading 21 saves and will be a tough obstacle for Carolina hitters. It's a quick return to Myrtle Beach for the All-Star Game, which was most recently hosted by the Pelicans in 2008 when the game drew a BB&T Coastal Field record of 6,599 fans. The '08 game featured several current Major Leaguers, including Pablo Sandoval and Matt Wieters. * On June 16, the Carolina League announced two changed to its All-Star roster. Pitcher Chris Dwyer replaced pitcher Nevin Griffith (Winston-Salem), and pitcher Jose Duran replaced pitcher Alex Wilson (Salem). Danny Wild is a reporter for MLB.com. This story was not subject to the approval of the National Association of Professional Baseball Leagues or its clubs.